Part 1 gave some ideas for women who are currently breastfeeding to celebrate World Breastfeeding Week. Part 2 has some ideas for women who have breastfed in the past but are no longer nursing a child. Part 3 has ideas for exclusive pumpers. Know of any pregnant women in your life or brand new moms? As someone who has breastfed previously, you know what products were helpful and which were not. Consider making up a gift basket of goodies for the nursing or potentially nursing mom. It could include themed things such as breast pads or practical things such as healthy snacks and drinks, a book on nursing, a breastfeeding pillow, nursing attire or anything else you might have found helpful. La Leche League is an organization that supports breastfeeding and they have trained volunteers that offer breastfeeding support. If you fit the requirements and become a LLL member you could train to help others breastfeed. A doula is someone is is there for a pregnant woman throughout her pregnancy, childbirth and the first little while after birth to help and be supportive through the process. Try searching for “become a doula [name of country]” to get started. 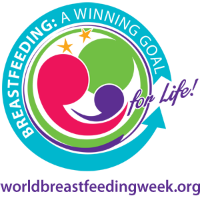 Share a supportive message about breastfeeding on social media, email or through good old word of mouth. 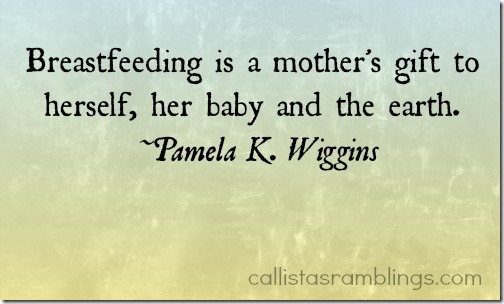 Write it yourself or find a fun graphic to share but let it be known that you support breastfeeding. In fact I made three for you to use. Feel free to share these on social media. The next time you are out in public and you see a mom nursing her baby, walk over to her and tell her how happy you are to see her feeding her baby no matter where she is, as it should be. Compliment her on what a great job she is doing. The more we support women nursing in public, the more chance of it becoming the norm that it once was. Remember when your child was younger and you nursed. Whether it was one day or 3 years, you have memories of nursing. Take a moment to lay back with your eyes closed and just remember. If you have photos or other memories from then, take a look at them. Talk to your child about how you chose to feed him or her and why. If your child is a girl, express your hope that she will one day breastfeed her children too and that when that time comes, you plan to be there to support her.